How to stay on top in organic search engine results. Search Engine Optimization (SEO) is an area of marketing focused on increasing a websites visibility in search engine results, and crucial in keeping your business in view of your customers searching for you. Although a complex subject, SEO efforts are generally centered around the application of keywords you want your site to show for in search engine result pages (SERPs), otherwise known as ‘organic rankings’. Organic rankings are determined by search engine algorithms that match the most relevant results to the user’s search. In addition to keyword relevancy, organic rankings are also comprised from site performance and quality content. So, why is it important for your business to put in the effort to be at the top of organic results? Studies show that the top three results receive over 60% of clicks — you’ll want to appear in those top organic three results. (Keep in mind that there are results that will appear above the organic results — these are paid advertisements, which you can read more about here). Optimizing your site. SEO is a moving target. Search engines are continually updating their algorithms to better match results to searches and improve user experience. Google rules supreme in the SEO world and currently owns 70% of the search engine market. Because of this, you will want to make sure your site is optimized to perform well in Google SERPs. The first step in starting an SEO campaign is to establish a list of keywords that your customers are using to find businesses online. There are two kinds of keywords: long tail and short tail. Short tail keywords are three words or less and and less specific, therefore they generate a much larger amount of traffic. Because they cast a wider net, they require more time and optimization on your part for them to be effective. Long tail keywords are more than 3 words and are more specific to the type of traffic you want to your website. While this brings a lower traffic volume, it results in less competition to rank and higher conversion rates. Next is on-page optimization — optimizing the content that customers see on your site. On-page optimization is working your established keywords into your site in the metadata as well as page copy and meta tags. 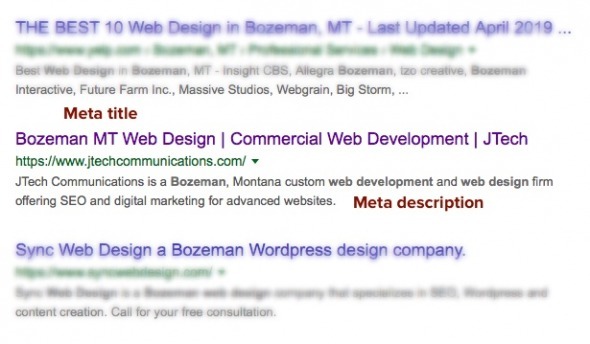 Optimizing your metadata helps to tell search engines what each page of your site is about and this is some of the information that will show in your search result listing and attract people to visit your site. Optimizing page copy can be a balancing act — the idea is to include keywords as much as possible for Google, but without ruining the quality or readability of the content for humans. While you may be tempted to keyword-stuff to rise in search results, over-optimized content will drive off paying customers and diminish your search visibility. Content marketing is producing quality content on an ongoing basis. Your website is the perfect place to offer value through quality content on a blog or news page, or even through downloadable resources with tips and tricks to make your client’s more successful. Content marketing is a major player in SEO affecting your link profile, through link building. Link building is the act of pursuing other sites to give a link from their site to yours, which establishes a vote of confidence, informing search engines that your site offers value in some way. There are several ways to gain links, but the best is to create high quality, informative and authoritative content that will be valuable to your industry. One last important area of optimization is technical SEO. Technical SEO involves: index status, crawl errors, internal links, sitemaps, redirects, broken links, and pretty much all of the technical functionality of your site. Search engines want to give users the best possible experience, this means they want the sites that they are referring searchers to to be technically sound and perform well. If you site has a fair amount of broken links, images or slow loading time, it will no doubt affect your search ranking. While sometimes fixing these issues are simple, larger issues need to be addressed by a web developer. Patience is key. If you’re launching a brand-new website, Google will give you a small boost in the beginning, but your site will NOT continue to see positive results if you don’t implement a long-term SEO plan. When implementing SEO whether on a new site or old, it can can take a few months to recognize real results. A good rule of thumb is to think about the long-term benefits of an SEO program and be patient with your progress, working with your marketing team over time to measure and improve results. The game is long and that is why it’s crucial to your search visibility and businesses success to start an SEO program as soon as possible. The benefits SEO are numerous. The most beneficial result of a properly executed SEO campaign is that your site will begin to gain more qualified traffic that is more likely to convert visitors into paying customers and longtime clients. A well-optimized site will rank for user searches already targeting products or services in your industry, meaning you will gain traffic that is worth something to you, and increase the efficiency of your business. Additionally, a site containing informative and valuable content for users in your market is more valuable to your customers, creating a mutually beneficial relationship and building trust in your audience. All of these benefits lead to one primary goal — to improve your business’s bottom line. With an authoritative SEO campaign, you can develop your site to be more informative, more technically sound, and more effective in converting online users into customers. Our digital marketing team at JTech have many years of SEO and content marketing experience and have helped many customers achieve and maintain high rankings in search engines. We work as your digital strategist to make you successful online. We’re here to help you stand out from competition, improve visibility and ultimately improve your bottom line. If you process customer credit cards online, it is important to be PCI compliant and understand the different types of compliance out there. The Payment Card Industry Data Security Standard (PCI DSS) is a set of security standards designed to ensure that companies that accept, process, store or transmit credit card information maintain a secure environment. The PCI DSS applies to any organization, regardless of size or number of transactions, that accepts, transmits or stores any cardholder data. SAQ-A — This is the most basic level of compliance and the one that any small merchant would want to qualify in. It requires only the questionnaire for compliance, no quarterly vulnerability scans and no annual penetration test. To qualify, no credit card data can ever be seen by the merchant’s website and payments must be processed through either an iframe, or secure url belonging to a processor that is PCI compliant (such as NMI). SAQ A-EP — This level of compliance requires quarterly vulnerability scans, and annual penetration testing. This applies when Credit card information is entered directly into the merchant website and is used primarily by larger ecommerce sites with a high volume of transactions. SAQ D — This level of compliance applies to any site that processes credit card data in any way before transmitting it to the approved processor. SAQ D also requires annual penetration testing and quarterly scans and a much more complex questionnaire. JTech has implemented the appropriate requirements of the PCI DSS to provide our business clients with layers of security to make it much more difficult for attackers to gain access to payment card data. We implement PCI processes to enhance defense, strengthen security and simplify compliance. If you have any questions about PCI compliance for your business, feel free to reach out. 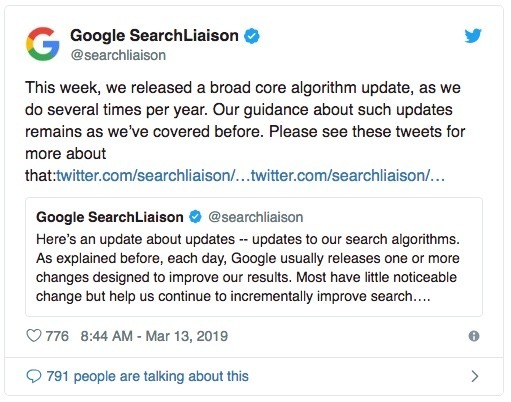 Google just launched the March 2019 Core Update to their algorithm, changing the way your business may appear in search results. Google is constantly updating their search algorithm, (nearly 500-600 times a year!) which his part of what makes SEO such a quickly-moving target and complicated subject for business owners. As an SEO service provider, JTech’s Digital Marketing team pays close attention to Google search algorithm updates and the reactions from the SEO community. Join us as we explain the latest announced update: the March 2019 Core Update. In the past, Google has named their algorithm changes things like “Panda” and “Penguin.” This time, they went with March 2019 Core Update. “Core” refers to the update being specific to the core of their algorithm, and “March 2019” referring to the date of its release, so that these updates are chronologically easy to keep track of. Each year, Google will implement several core updates for their search algorithm, which usually affect search rankings in some way. These updates are meant to help Google more accurately match search results to search queries and most of the time Google will not alert the public to an algorithm update and the SEO community catches on through rapidly changing rankings. Early comments seem to indicate that sites in the health and medical industry were the most impacted, but Google has stated that there is no specific targeted industry for their algorithm updates. Some SEOs are reporting the return of traffic they lost from a Google update on August 1, 2018 suggesting the reversal of this update. A survey from Search Engine Land shows that 60% of those surveyed report the return of lost traffic from a previous update. Alternatively, some who reported gains from earlier updates are reporting the reversal of those gains. Google’s search algorithm updates are frequent, and the current update puts a high priority on quality content. Their job is to match the best answers to questions, one way to make sure your site shows for related queries is to continuously generate high quality content. Churning out solid content but your site is still struggling in the rankings? Check out Googles webmaster, content and quality guidelines here, or contact our team and we can provide a thorough site evaluation. You can use conversion funnels in Google Analytics to track behaviors on your website to see who is becoming a customer, and how. A conversion funnel is a term in Analytics referring to the chain of actions a user follows before reaching a goal you’ve defined. A typical conversion funnel originates from an ad or landing page, and ends with the user filling out a contact form or making a purchase. A step by step example would be: clicking on a display ad > arriving on a website’s landing product’s page > reading about product details > adding product to cart > payment processed > order confirmation. A conversion funnel typically originates from a marketing effort and direct advertising, such as a display banner, search ads, social media posts and email promotions. A conversion funnel is when the user moves from this starting point to your website and converts them into a customer, whether purchasing a product or submitting a contact form to inquire about your services. When tracking user behavior through a conversion funnel, it is not uncommon to see user numbers decreasing at each step of the funnel as you get closer to the conversion goal. Optimizing this conversion funnel involves analyzing behavior data at each step of the process and making changes to that process to more effectively convert users. Once your funnel is set up, Analytics will start collecting data on user behavior as they move through the funnel informing you where and when you lose users. This can help you identify bugs and technical errors, determine if the tone of your copy is altering a consumers decision process, and if your site is easy to navigate. Pay attention to headlines, page copy and element colors on your landing pages. It’s the first thing people will see when they come to your site, so make a good first impression. You can find our blog article on creating an effective landing page here. A/B test variations of your landing page to determine which headlines, design and calls to action work best. Ensure all links on your site work and that your contact form submits correctly. Users want to know that their data is being processed privately and securely. Trust elements are symbols and logos signaling to the user that your site is secure. If your site has checkout process, make sure it has your branding and a possible VeriSign Logo, this is internationally recognized symbol letting user know your checkout process is secure. Optimize your product or service detail page with compelling copy for your visitors and keyword rich copy for search engines. Remember, when optimizing a conversion funnel, your goal is to determine what steps are causing customer confusion or negative reactions, and eliminate these factors. Conversion funnel optimization is an important part of attracting a fresh flow of online customers. Your conversion funnel may touch many different parts of your digital infrastructure, so clearly defining each step and tracking metrics at each point will give you a solid idea of what needs to change to create more conversions. Contact our digital marketing team if you have questions bout setting up funnels in analytics and we’d be happy to help. As a business owner, spending your marketing dollars effectively is essential to reach new customers and grow your business, and since most people are shopping online now, brands have shifted their marketing focus away from traditional methods and toward digital marketing. One of the most effective methods of digital advertising is using the Google Ads platform, specifically pay-per-click (PPC) advertising. In this article we will be exploring why your business should consider a pay-per-click campaign to reach more of your customers online. PPC search advertising in a search result. What is PPC Search Engine Marketing? PPC is a model of digital marketing that allows business owners to advertise themselves, but only pay an advertising fee if the advertisement is clicked on and a user is directed to your website. Your PPC search engine marketing ad will be displayed at the top of the search engine results page and are targeted for specific search queries and geographic location. Higher Conversions — Google Ads PPC traffic converts 50% higher than organic traffic, and some figures show that businesses utilizing Google Advertisements earn double their ad spend with PPC advertisements. Global Reach — Google is the leading search engine in the world — it owns 70% of the search market share. This means that Google sees over 2 trillion searches per year making it essential that your business is present in its search engine results. Consistently Improved — Google Ads currently accounts for 97% of Google revenue. This means that Google is constantly improving and adding new features to its cash cow to make it more effective for businesses to use. Provides Data — Google gives you access to many different data points throughout the life of your campaign to allow you to gain insight and better target your market segments. Cohesive Workflow — Through this platform, you can organize your campaign into individual ad groups, each containing ads targeting conversion for a specific area. For example, if you are an auto shop you could have separate ad groups targeting body repairs, aftermarket work, and oil changes all separately. Scalability — Google Ads is also very scalable, allowing you to add money when you need to in order to increase conversions. Direct Contact — Your customers can call you directly from your advertisements! Consider that 70% of mobile customers call through mobile ads. Determine the subject and goal of each ad. The first step in this process is determining what your campaign structure will be. For example, if you are a camera shop, maybe your goal is to sell cameras, lenses, and accessories, meaning you will develop ad groups for each one of these products. Define keywords. Once you have defined your advertisement goals, the next step is understanding the language customers are using in their searches. There are a number of great tools out there that can help you gain an understanding of trending keywords. Compile a keyword list for each ad group you intend to use. Start building your campaign. The next step is to build out your campaign within Google Advertisements. There are many great step by step guides that can help you do this, but Google itself is great at walking you through the setup process. Define your audience. Google allows you to target searches worldwide or specific geographic areas. This is where having a clear understanding of your audience and goals is essential. Decide on a budget. Google allows you to set an average daily amount that you want to spend. Keep in mind that you can add or subtract from your budgeted amount at any time. A marketing budget can essentially be infinite, so it is best to simply set a budget for yourself — how much money do you want to allocate to your marketing campaign that will put you in front of many potential customers? Define your campaign bidding strategy. Google presents many different options when it comes to ad bidding, but in this article we will cover only enhanced CPC bidding, which is an option that automatically adjusts your bids for clicks that are likely to get you a conversion. This means that if your bid is set too low on a well-performing ad, Google will automatically adjust your bid to increase your chance of receiving a click. Quality score is a rating from 1-10 based upon your click-through-rates, the quality of the webpage they are landing on after clicking the ad, and relevance of the ad to that page. This formula is important because with a higher quality score you can have a lower bid and still have your ad displayed above those of your competitors. 7. Apply Google ad extensions. Extensions allow you to add links to your ads that direct users to specific pages on your site, or a call to action prompting users to call your business. 8. Creating your ads. You have the option to use text ads or responsive ads. Text ads are the standard ad that includes 3, 30-character headlines and 2, 90-character descriptions. Responsive ads allow you to ad as many headlines and descriptions as you like and Google will pick and choose what combination of headlines and descriptions to display based upon the user search. When writing ad text, remember that you are trying to match your ad with what the user is searching for, so using some of your keywords in your ad is a good idea. Now that your campaign is setup, you’re going to want to pay close attention to the campaign results through each month. Pay attention to what ads are performing the best and which are not. All of your selected keywords are not likely to convert, so revising your keyword lists to contain only good performers as you gather data is a good idea, specifically those that may have high impressions but a low click-through-rate. Search engines are a moving target and ongoing management is necessary to ensure you have a successful campaign. Google Ads is an extremely effective advertising option for businesses of any size or industry. Google Ads presents the most effective PPC platform due to its flexible features and global reach. It is important to remember that you need to know your customers, have a clear idea of what your goals are, and be ready to put some time and effort into setting up your first campaign. If this all sounds overwhelming to you, our digital marketing team are experts at Google Ad campaigns and are here to help you whether you are managing an existing effort, or would like to start a new one. So you can grow your business, faster. The new Work Order Approval System in My JTech allows you to review and approve changes to your website at the click of a button. We are excited to roll this new feature as it will conveniently allow you to request changes and edits so your business can continue moving forward when you need it to. 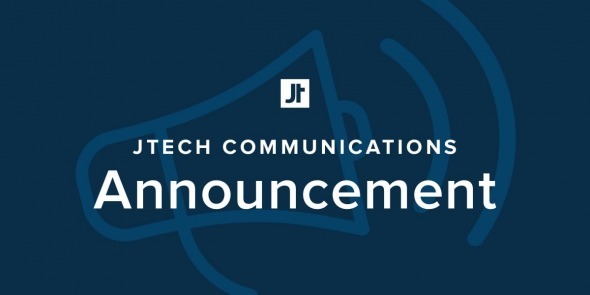 Email us at support@jtechcommunications.com with your request. After we’ve estimated your request, you’ll receive an email asking you to approve the work order. If you are an admin, you’ll be able to approve the work order directly. If you are a user without admin access, the email will explain who has access to make work order approvals in order to move forward. When you click the button to approve the work order, you will be taken to My JTech. You are then given the choice to approve, make changes or cancel the request. Hit “approve” and you’ll receive a confirmation. You’ll be placed directly into our production queue and our client service team will contact you directly if any question arise during production. You will receive an automated email once your work order is completed. If you’d like to make changes to your work order, simply select the “make changes” button instead where you’ll be able to describe what you’d like changed. Once your changes are submitted, our team will get in touch with you with a new estimate. As always, if you have any questions, you can always call us. Active work orders will appear in My JTech along the righthand side bar. For a more detailed breakdown of this new addition, please visit our helpful Support Articles in My JTech. Does your logo represent who you are as a business? It’s easy to get lost in the laundry list of things you need in order to start your business off on the right foot — a solid business and financial plan, an online presence and market research — the list goes on. Don’t let your logo be an afterthought to all of these things, as it will be at the visual forefront of your business and brand. Your logo is representative of your company’s personality, is the foundation of the look and feel of your website and branding and differentiates you from your competitors. In today’s market, your customers are being bombarded with information overload, it is important to have a strong logo to help you stand out, be consistent and build customer recognition and loyalty. Think of your favorite brands — Pepsi, Old Navy, Kelloggs, Midas…just saying their name brings up an image of their logo and branding colors. Our brains process images 60,000 times faster than text, making your logo the most effective tool to make consumers remember you. This differentiation also extends to your messaging, packaging, advertising etc. but it starts with creating a logo that captures the identity of your business and sets the foundation of your branding efforts. Your logo is usually your first impression with new customers. This means that you want your logo to be welcoming, inviting new customers to get to know and trust your brand. As you grow your business, your logo will be exposed to more and more consumers and creating a consistent logo and brand helps to create the impression of familiarity and trust among consumers. A logo should be memorable and recognizable out of context. It should be able to be replicated in monochrome, regardless of if your brand does include color and it should be simple, scalable and unique. 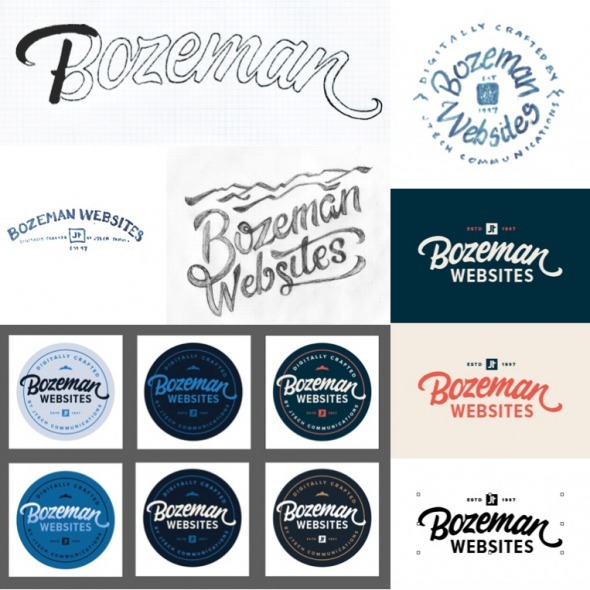 Although a perfectly symmetrical logo is not going to be an option in all cases, it is good to note that humans are drawn to symmetry and either way, a good strong logo usually has a sense of balance. It is also very important that your company likes its mark and is proud of its representation, as a brand pivot can be costly and eliminates brand consistency, confusing your loyal customers. Are you happy with your logo? Designing a strong mark for your business is integral to maintaining a consistent brand users can identify and remember. If you need help creating a logo, or any branding assets for your business, our team has years of experience creating eye-catching, professional, and unique logos that will set your businesses image off on the right foot. Contact us if you have any questions and we’d be happy to guide you in the right direction. Business Process Automation (or BPA) is the process of using technology to automate business processes in order to eliminate manual and other time-consuming tasks. Automation can be a powerful tool for your business and help you to grow in your market by freeing up time that was once spent on these tasks and instead focusing on your goals and growing your products and services. In this article, we will be discussing what advantages business automation can bring to your business. How automation can help you. Integrate multiple processes. An example would be automating financial recording tasks that previously required an employee to manually input data into accounting systems and project management systems. This will improve your bottom line by building a more efficient workflow. Reduces errors. When you have employees manually processing documents or data, it increases the chances of human error. Automating these tasks can secure your company against potential risks and costs associated with improper data entry or other mistakes humans make on a daily basis. Increased morale. Eliminating mundane tasks and allowing your employees to focus on jobs that require their trained skills will make everyone happier. Having skilled employees doing what they love has a lasting impact on overall office productivity and keeps your company successful and moving forward. Consistent customer experience. When automating customer-facing processes, you create a more consistent experience for your customer, as they interact with the same automated system each time and will know what to expect. This ensures your clients trust and keep coming back to you, increasing repeat business. Now that you’ve learned some of the benefits of automation, let’s explore some things you can build to automate your business. Potential employees applying for a job. Do you still use a paper application? Automate this process by building an online application job seekers submit. It can then be directly received and reviewed by your HR department. Employee timecards. Have employees clock in and out, or track time and other work expenses online. This data can then integrate with your accounting software and process payroll automatically. Inventory management for ecommerce. If your point of sale system or inventory software has an API, our team can integrate it into your site to allow for consistent inventory management and online purchases. It is also possible to collaborate with UPS or other shipment providers to manage incoming and outgoing product. Customer support. If part of your business involves customer support, we can build a chat system for you that direct customers who need assistance to the correct person who can help them though chat or other means of communication. These are just a few of the many examples of how we’ve helped our clients use the internet to be more efficient. Once you have identified an area in your business that can be automated, finding the right solution is the next step. Start saving money and time, today. Business automation presents an opportunity for most businesses to increase their efficiency and save time and money. Our development team at JTech has the experience to help you with the design and implementation of automated systems so your business can focus on the bigger picture and improve your bottom line. Contact us today If you think your business could stand to benefit from automation and we’ll do the rest. WordPress currently accounts for 19% of the websites out there. With this level of popularity comes great vulnerability, especially because many users rely heavily on plugins for features necessary for running their business and serving their customers. A plugin is an addition outside of the core platform that adds features — such as ecommerce, spam filters or a photo gallery — to a canned template site such as WordPress, Joomla or Drupal. It is important to understand the weaknesses of plugins and the threats they can present to your website and business and explore some possible alternatives so that you can continue to do do business online without being compromised. If the developer vanishes and takes their plugin with them, your site now has lost that functionality. Plugins are not secure; every plugin used on your site presents another point of vulnerability. 20% of the top 50 most popular WordPress plugins were open to the most common web attacks. Plugins will compromise performance. Most users expect your site to load in 2 seconds or less, meaning that a slow load time will lose you visitors. Your search ranking will suffer. Search engines like Google want sites to load quickly and easily to improve user experience, meaning a site weighed down by bloated plugins will slip in rankings. As you can see, there is a lot at risk associated with relying on plugins to your template system. There are, however, other available solutions out there. In order to make the best possible investment in your business, choose to pursue a custom built site with a developer you trust. A custom site has a single code base that only one developer has control over so there is no unknown code from a third party. With a custom site, you develop a personal relationship with a developer who has a vested interest in the success of your business and they build the code of your site from the ground up, with your needs in mind. Although a lot of this news sounds negative, you can be confidant knowing you have a trusted partner available to help you, whether you’re ready for a custom site right now, or not. The team here at JTech has over 20 years of code base under us, and we’ve worked hard to improve and update it on a constant basis. This keeps the sites we build secure, performant and scalable. If you experienced a data breech recently, are sick of the confines of a template system and are ready to build something custom, come talk to us — we build websites at any price point. Additionally, if you are having trouble with your Wordpress site, we have the experience necessary to get all of your plugins working and get your site up and running to eliminate downtime so you can get back to work. KP Squared Crane Rental Services benefits from a new website. A website allows you to present yourself as a reputable company and ensures you are findable by potential customers. In fact, a 2017 study shows that 54% of consumers search online for local businesses on a monthly basis — chances are, you won’t show up in those search results if you don’t have a website. 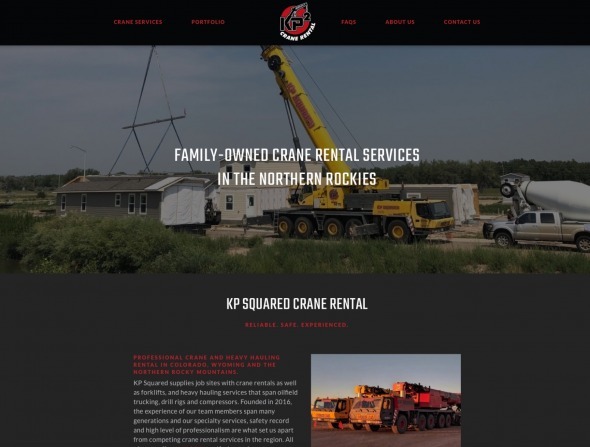 KP Squared is a family-owned crane rental operation based out of Greely Colorado. They specialize in providing rentals and operators for cranes, forklifts and other heavy-hauling equipment in the Rocky Mountain region. They were in need of a custom website to display their services and market their business to those searching for them online- and we were happy to be their technical partner. We're excited to announce the launch of KP Squared’s website! Here are a few notable features that will help them improve their bottom line. Project Portfolio — A great way to build credibility and trust is to position yourself as an industry expert and highlight past and current projects in a portfolio page. Their portfolio page also serves as a place to highlight testimonials from some of KP Squared’s trusted partnerships with known names in the oil and mining industry. Answering Customer’s Questions — Frequently Asked Questions (FAQ’s) are a great way to show your customers that you are a knowledgeable company and a reputable resource to them. KP Squared is proudly owned and operated by the Perry family, who have been in the crane business for many generations. Although equipped with all the amenities of their larger competitors, KP Squared prefers to be a small operation which allows them to give each of their customers the utmost care and individualized service they’re looking for. With their site’s FAQ section, they are able to display this credible narrative on their site. Customer Communication — In addition to serving customers, a website can go to great lengths to serve your staff as well, allowing them to work more efficiently. A simple way to alleviate extra office work is by collecting data from your customers directly in your website’s contact form. KP Squared, for example, needs to know load height, load weight and load distance, as well as accessibility of the area their equipment will be working in. This will help KP Squared staff better understand what cranes are needed for a job without having to spend the extra time to backtrack and ask those questions in a separate transaction.